A couple of folks have asked me for a cream of kalabasa soup recipe. Mrs. MM is more the kalabasa soup expert, but here is the simplest way I know how to prepare a kalabasa soup. Take some butternut squash ideally, but our own kalabasa (bright orange, not under-ripe) will do nicely, and peel it, de-seed and de-gunk it, then cut into large chunks or about 1 inch square, brush with good sweet butter and season with salt and white pepper, and place on a foil lined pan and into a hot oven, say 400F for some 30 minutes or so until the squash is soft and cooked. It should be slightly caramelized but not burnt. 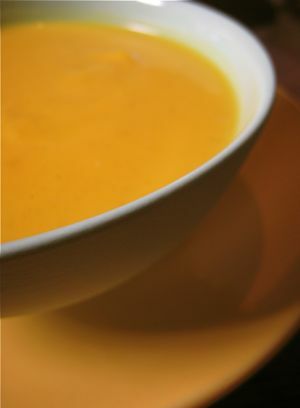 Put all the roasted squash into a pot and add several cups of good homemade chicken stock or low-sodium canned dark chicken stock. Sorry, I never measure when I make this, I just do it by feel… if you want a less thick soup, add more stock, and vice-versa. Add some spices here that might be to your liking, Mrs. MM uses a touch of curry powder. Then blitz this all with an immersion blender that goes straight into the soup pot. If you don’t have an immersion blender, then blend this in small batches in your blender. BUT BE DARNED CAREFUL, hot liquids being blitzed is often a recipe for an explosive accident. Season with salt and white pepper. Just before serving add some cream to the soup and mix it well. Some just put a small dollop of creme fraiche on the surface of the soup before serving. This is a hearty, relatively healthy soup and it freezes well. But do not put cream in the soup before freezing it. Always add the cream when you heat up the soup, just prior to serving. 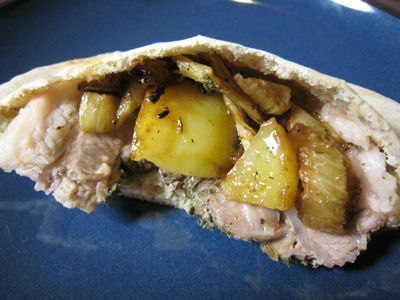 Some of the hot porchetta that I cooked a couple of days ago, together with the baked potatoes and fennel stuffed into a whole wheat pita bread was an excellent little sandwich and perfect complement to the bowl of kalabasa soup. I’ve always loved kalabasa, and until now I’ve only had this tasty vegetable only in pinakbet, mongo soup and other stir-fried dishes. When I go home, I’ll definitely ask Ma to cook this one up. Thanks MM! Do not put the stopper in the cover of the food processor when blitzing hot liquids, the heat creates a vacuum hence the explosive effect. The hole will act as a vent and little or nothing spatters out this way. thanks for the pumpkin soup recipe mm. Looks good. That’s the basic way indeed and can’t get any simpler than that. For spices, I’ve tasted soups with nutmeg and/or cinnamon. Something akin to pumpkin pie spice but to a lesser degree. 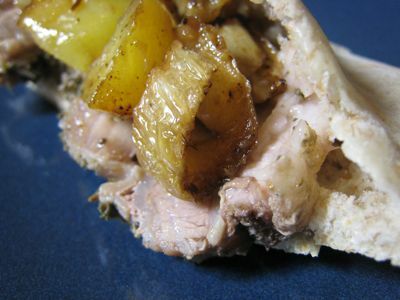 Love dunking grilled/toasted focaccia in this. For the fat conscious, try skim milk. I know it doesn’t taste the same but it’s worth the calories. =) Plus it helps that it’s all I’ve ever known to drink since childhood. this couldn’t have come at a better time. 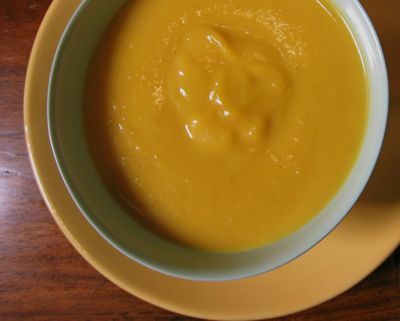 i’ve been obsessing about how to make pumpkin soup for my 3-year old who loves it and this recipe sounds super simple but delicious. Love this too with my appetite of a three year old complete with an exorbitant imagination. I can easily pretend that it is lobster bisque I am sipping. Make it too thick though and Iâ€™ll push it away because then it looks like the dreaded mushy contents of those tiny jars of Gerberâ€™s. yum! I love kalabasa soup…most times I add cinnamon into it as well.